Also known as ‘the Gateway to the Coromandel’, Thames Township is a lovely place to visit. It’s the main shopping location on the peninsula with many boutiques, a historical main street and the modern Goldfields Shopping Mall. Thames Market, held every Saturday morning at the Grahamstown end of Pollen St, offers an interesting range of stalls selling local crafts, produce, plants and collectibles. 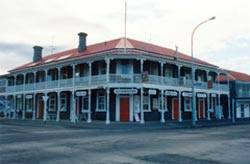 Thames was one of New Zealand’s largest towns in the late 19th century. It was built on the pioneering industries of Kauri logging and gold mining. The history is still alive today in the many pubs, buildings and activities found in the area and of course in the Historical Museum, where an excellent display of the gold rush days can be admired. North of Thames, State Highway 25 takes you past many pretty little bays and calm beaches. Along the way you will pass through Whakatete, Ngarimu, Te Puru, Tapu and other small settlements. Six km inland from Tapu, you will find the fabulous Rapaura Watergardens. This is a 64-acre private estate nestled in the middle of the Coromandel Forest Park that offers something for everyone: native trees and ferns, seasonal flora, lily ponds, bridges, streams and ponga sculptures by an award winning artist. A relaxing bushwalk takes you to a cascading waterfall named ‘The Seven Stairs to Heaven’.